Fire trucks have always been a subject of great interest. They must be at the ready and a great deal of excitement is aroused when they are in use. 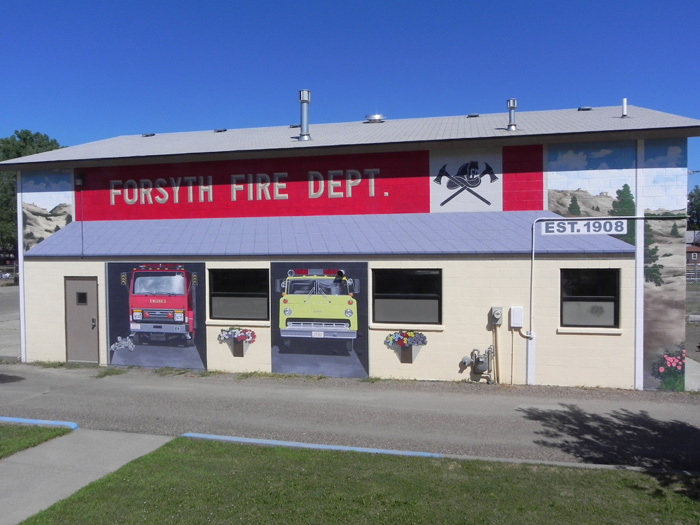 This fifth mural in Forsyth is located on the south wall of the City’s fire department building. Two of the fire trucks are painted on the painted door openings just as they would be seen if the actual doors were open. The wall and painted roof design illustrates the added 3-D effect for depth and allows room for distant hills and trees to add to the panoramic scene. Wall sconces with colorful flowers are painted along the doorways. The functional windows are kept in place as is the entry door. To add interest for the younger of us, a mother Dalmatian dog and her two playful pups lounge on the floor beside the giant red fire truck. Visitors’ kids tend to want to pet the cuties. This mural is located in the second block of north ninth street.